FREE Sterling Silver Glitter Oval Hoop Earrings! You are here: Home / Great Deals / Christmas Deals / FREE Sterling Silver Glitter Oval Hoop Earrings! 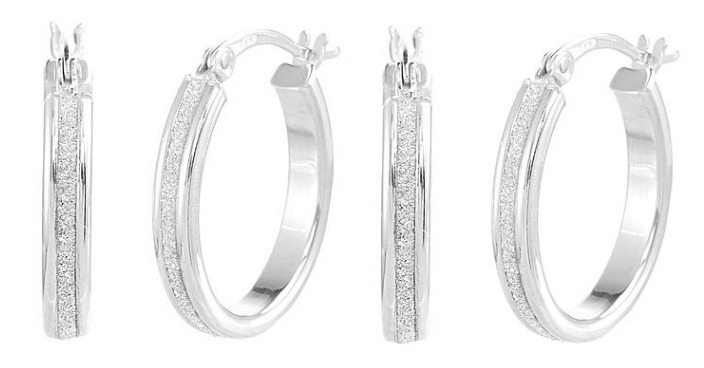 Sears has these Sterling Silver Glitter Oval Hoop Earrings on sale for $4.99 (Reg. $12) and you can get back $5.04 in Shop Your Way points, making it FREE! Designed with a single stripe of sparkle, the Sterling Silver Glitter Oval Hoop Earrings instantly upgrades any outfit. Constructed of sterling silver, you can wear these for years. These hoops can be worn for a night out or to dress up a more casual look. These earrings can easily transition from day to night to weekend. Easily mix these hoops with a pantsuit for work, sweaters on the weekend or a cute dress for date night.